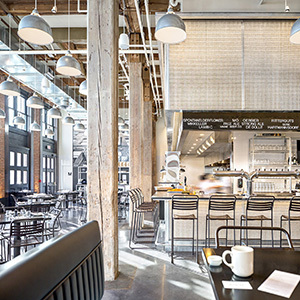 American Craft at Hyatt Chicago | Bentel & Bentel Architects/Planners A.I.A. AMERICAN CRAFT AT HYATT REGENCY CHICAGO, CHICAGO, IL - Chicago as the historical “marketplace” of the nation (what Sandburg called the “Hog Butcher to the World”) is present in the re-imagining of the atrium lobby as an urban market place in which each venue possesses the choreographed image of a store front. American Craft, the lobby restaurant is introduced by its pergola-framed bar and dining perches over the water feature.